Firstly, please excuse the picture. It’s not my best. My husband and I had a ball game that night and I was in a bit of a rush. I didn’t want a bad picture preventing me from posting a delicious recipe, so I’ve decided to go ahead, unflattering picture and all. Falafel are a traditional middle eastern food, though where they originated in the middle east is still debated. Made from mashed chickpeas (or fava beans in Egypt), the mixture is formed into a ball or patty and then served in a pita. They can also be served by themselves as an appetizer, which is my preferred way of eating them. While you can find these little gems pre-made at the grocery store, I prefer to make them myself. Mostly because I’m a pretty big fan of knowing what exactly is in my food. Even though the ingredient list for this recipe is long, it comes together quite quickly. 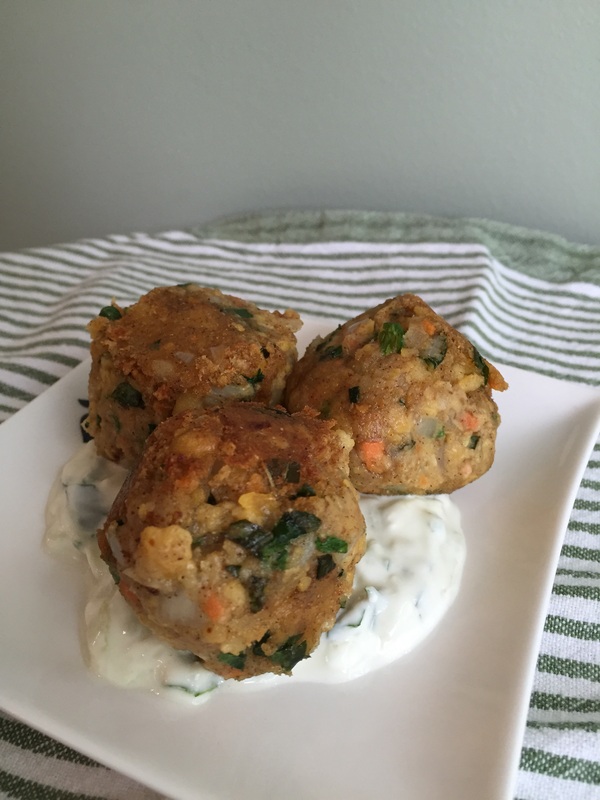 I served the falafel with tzatziki because I love how it’s tangyness (I don’t think that’s a word, but you know what I mean) off sets the savoury flavour of the falafel. Enjoy! Remove the skins from the chickpeas and then mash them in a bowl using a potato masher. You could also use a food processor. I just find that by the time I assemble mine, I could have already mashed the chickpeas by hand. Stir in the remaining ingredients until well combined. Roll the mixture into 2″ balls. Heat the vegetable or coconut oil in a frying pan. A few at a time, add the falafel to the pan and cook until golden on all sides and heated through. *Another option for cooking the falafel is to place them in the oven at 400 degrees Farenheit for 15-20 minutes. Stir all the ingredients together until well combined. Store in the fridge for at least 30 minutes, until ready to serve. It’s not always the easiest to find time for pictures, is it? I’ve been hosting friends lately, and as dinner’s already usually late, I’m rushing to take a picture or two (or ten) before everybody’s already finished eating. Lackluster photo or not, the falafel’s still look delicious. Thank you 🙂 I try to be ahead of the game and leave myself time for pictures, but too often my family’s half done by the time I sit down to eat, lol. I think Tangyness is totally a word 😉 These look really yummy, we make these quite a bit in our house and love to eat them with salad wrapped in pita bread. Thanks for linking up with us for Fabulous Foodie Fridays, I hope you have a great weekend! See, I thought “tangyness” could be a word. Spell check didn’t agree with me, though, lol. Have a wonderful weekend! And thank you for hosting FFF! Looks pretty darn good Natalie and I love the ingredients with all the fresh herbs. I love the sauce with the yogurt. I am a yogurt lover or anything made with yogurt. Thanks for sharing on Real Food Fridays. Pinned and twitted. I love falafel but have never tried making them at home. I love that you paired them with tzatziki. This looks like a super flavorful, healthy meal!